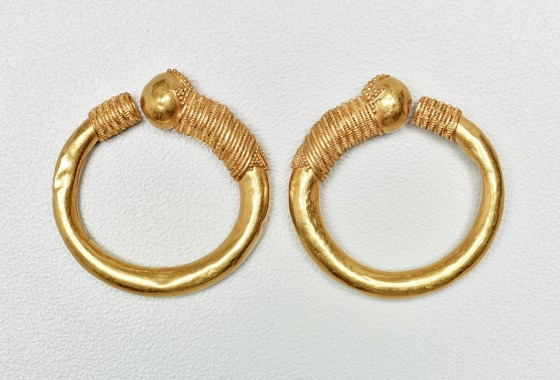 Hoop earrings are perhaps less spectacular than a bauletto earrings (1991.75.13.a-b) or ear studs (1991.75.20), but they had a long life in Etruria. This pair consists of hollow, tapering tubes decorated with a collar composed of circles of alternately plain and beaded wire. The other end is decorated in a similar way, but with the addition of a triangle of granulation at the beginning of the collar. This end terminates in a large gold bead, on the upper side of which the motif of the granulated triangle is repeated. 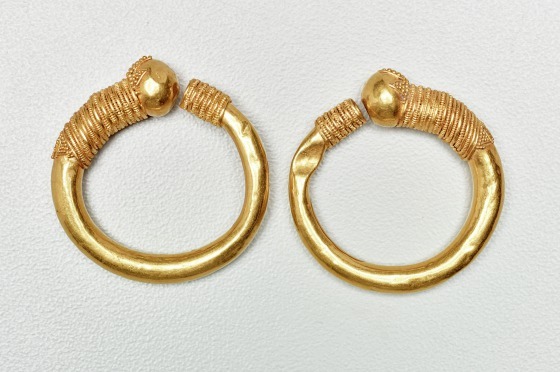 Each earring is a hollow tube, tapering slightly toward one end, where it is decorated with a collar composed of circles of alternately plain and beaded wire. The other end is decorated in a similar way, but with the addition of a triangle of granulation at the beginning of the collar. This end terminates in a large gold bead, on the upper side of which the motif of the granulated triangle is repeated. 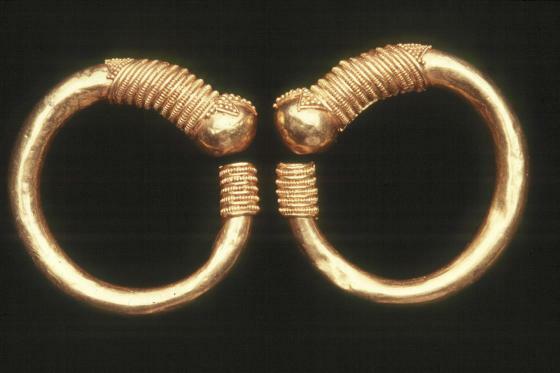 Barbara Deppert-Lippitz, Ancient Gold Jewelry at the Dallas Museum of Art (Dallas: Dallas Museum of Art in association with the University of Washington Press, 1996), 36; 126.